President Obama’s decision to replace Gen. Stanley McChrystal as the top battlefield commander in Afghanistan, a move freighted with military and political implications, vaulted the war to the top of the media agenda last week for the first time in seven months. The war accounted for 25% of the newshole studied for the week of June 21-27 according to the Pew Research Center’s Project for Excellence in Journalism. The removal of McChrystal as head of NATO forces in Afghanistan – only days after intemperate comments by McChrystal and his staff appeared in Rolling Stone magazine – unleashed a torrent of coverage, much of it commentary and analysis. The last time the war attracted attention of this magnitude was the first week of December last year when Obama announced he was sending 30,000 additional troops, according to PEJ’s News Coverage Index, which analyzes the content of the news from a range of media. The story managed last week to surpass coverage of the Gulf oil spill, which fell to second place (at 23%) after six consecutive weeks as No. 1. Among the twists the disaster took last week was the temporary removal of a containment cap that had been capturing some of the leaking oil. Technicians removed the cap to test it when another piece of equipment appeared to have bumped into it and damaged a vent. The economy, meanwhile, filled 8% of the space studied in print and online and time on television and radio, making it the third-biggest story of the week. Coverage of the economy last week was driven by the release of data that reflected a weakness in the nation’s housing market and Congressional negotiators reaching agreement on a financial reform bill. Election news was the fourth biggest story, as a series of primary elections saw Republicans nominate minorities for both the governor’s mansion and a Congressional seat in South Carolina, among other results. Election news accounted for 5% of the news coverage. The World Cup tournament in South Africa came was the No. 5 story, filling 2% of the coverage studied. The coverage of McChrystal surged mid-week as after Time.com and Politico posted PDFs of the Rolling Stone profile, in which both the top U.S. general in Afghanistan and some of his key aides made sarcastic remarks about Obama Administration officials. Within hours, both pundits and reporters weighed in on whether the President should fire the man he had put in charge of the war. After Obama relieved McChrystal of his command, and replaced him with Gen. David Petraeus, the reaction was swift and did not fit the usual partisan lines. Some conservative analysts applauded the president’s decisiveness, while a few left-leaning voices expressed disappointment that he didn’t take the opportunity to re-examine the mission of the war altogether. Filling fully a quarter of the newshole studied, the McChrystal firing brought the war back into the news in a way it had not been since Obama announced a surge of additional troops there during the week of November 30-December 6, 2009. 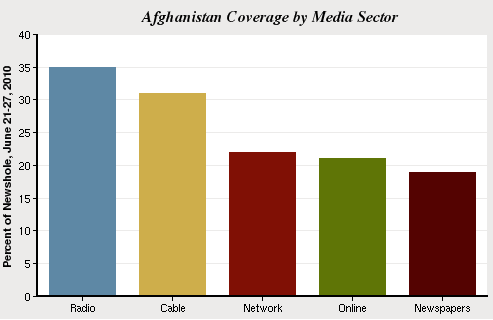 That week the war accounted for fully 27% of the newshole studied by PEJ and represented the most coverage the war had received since PEJ began monitoring the news in January 2007. Until the McChrystal story, indeed, the war had nearly fallen off the media radar: for the year through June 7, it accounted for only 3% of the newshole. Last week the war was among the top two stories across all media sectors and was No. 1 in newspapers, radio and online. But from Tuesday, June 22, when the Rolling Stone profile (titled “The Runaway General”) first appeared, through the end of the week, the war consumed nearly a third of the newshole and led in all sectors, hitting its peak on cable news (38% of the sampled airtime) and radio (42%) where opinion hosts found much to talk about. But Senator John McCain, the Republican presidential nominee whom Obama defeated, called the McChrystal decision “completely understandable…based on the civilian-military relationship that goes a long way back.” Appearing on Good Morning America, the Arizona Republican McCain also applauded the appointment of Petraeus. Coming in just behind the runaway general was the runaway well spewing oil and natural gas from the floor of the Gulf of Mexico, the story that had dominated the news for more than a month. The story, accounting for 23% of the newshole studied, was down from its recent levels of coverage. The week before, June 14-20, it accounted for 44% of the coverage studied, its highest level yet. Absent a high-profile Congressional hearing or dramatic revelation, coverage last week was driven by an accumulation of events. One was a temporary setback in the capture of leaking oil. A containment cap that had been siphoning oil to a surface ship was removed after engineers became concerned that it was damaged, but was later reinstalled. The biggest release of birds (38 of them) that had been captured and cleaned also attracted widespread coverage. ABC’s World News Tonight, for example, led one night’s broadcast with a round-up, noting that typically crowded beaches are now nearly empty across most of the Gulf states. The video package showed idled fishermen lining up for food vouchers and interviewed a woman who complained about the compensation she has received from BP, the owner of the well. The oil spill narrative also shifted away from the question of blame that dominated coverage June 14-20. During that week, stories about BP’s culpability accounted for nearly half the coverage, and those about the government’s response represented another third. Stories about the impact, clean up and efforts to stop the leak accounted for only one-fifth. But last week, the focus shifted back to the cleanup and impact, which accounted for 42% of the spill coverage. BP’s culpability fell to about one-quarter and the government’s response fell to about one-eighth of the coverage. The oil spill story remained especially prominent on television. It was the most-covered topic on network TV (27%) and cable TV (where it accounted for the highest level of coverage, 34%) last week. CNN, in particular, has poured resources into the story. “Day 63 and each new day brings with it new revelations, new reasons to think that the true story of what happened here is only now beginning to be known,” Anderson Cooper told viewers on June 21 from Louisiana. The news channel hosted a telethon, anchored by talk show host Larry King, that raised money for the United Way, the Nature Conservancy and National Wildlife Federation. The economy was the third-most covered story of the week, at 8%. Economic news was dominated by housing data that showed a sharp decline in home sales. A conference committee also reached agreement on a major financial reform bill during the week, and a jobs bill was blocked in the Senate by lawmakers concerned about federal spending. A smattering of primary elections came in at No. 4 with 5% of the newshole. Chief among them were the results in South Carolina where Republicans nominated Nikki Haley, the daughter of Indian immigrants, to run for governor and Tim Scott, an African American, to represent the party in a Congressional race. Scott defeated the son of the late Strom Thurmond, a U.S. Senator from the state who once ran for president on a segregationist platform. The World Cup, an event that typically attracts sparse attention in the United States, drew about 2% of the media coverage last week. The U.S. team surprised some by advancing to the second round of the tournament, only to be eliminated by Ghana in a close game. With 19.4 million viewers in the United States, the match was the most-watched soccer game ever in the U.S., according to data from Nielsen Media Research. 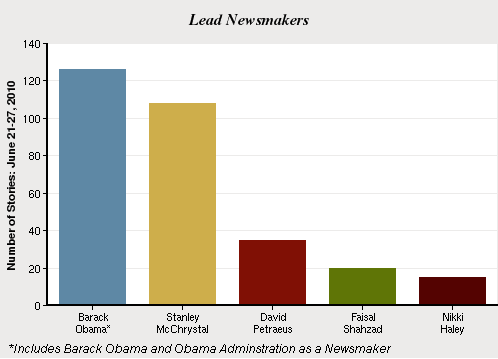 As is typical for most weeks, Obama and his administration were the top newsmakers in more stories than anyone else, 13% of the stories sampled (To be a lead newsmaker a person must be referred to in at least 50% of the story). The leading characters in the change in command of the Afghanistan war were the next biggest newsmakers. Fired Gen. Stanley McChrystal led in 11% of the stories sampled. His replacement, Gen. David Petraeus, led in 4%. Faisal Shahzad led in 2% of the stories. He pleaded guilty last week to charges stemming from a bungled terrorism attempt in which he parked an explosive-laden SUV in New York’s Times Square. At his plea hearing he warned that more attacks were coming because American soldiers remained in the Middle East. Nikki Haley was the fifth biggest newsmaker (2%). The Indian-American woman won the Republican nomination for governor in South Carolina.